Where to start, where to start. Positions with a “$0” in the 2017 column represent new positions (except for my wife’s stake in MCD. That was a clerical error in the prior year. Along with DWDP, who switched months that the company pays a dividend). Why am I bringing this up? If you count, I received dividends from 4 new companies compared to last year (PEP, D, TSN, MYBF). That is one quick way to jolt your dividend income compared to last year. These purchases are really starting to add up and make a difference. The story of 2018 continues to be dividend increases. Post tax-reform, we have all received some pretty sizable dividend increases in the current year. 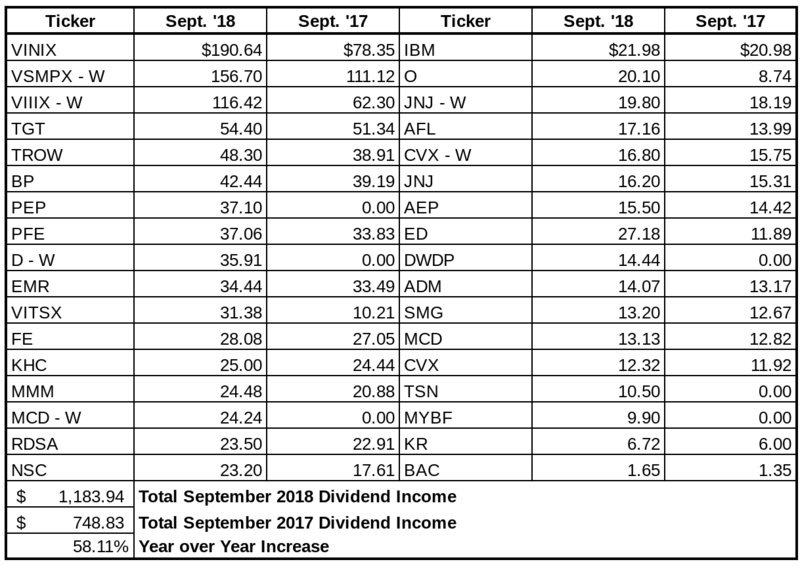 Looking at the chart, there are a ton of examples where my dividend payment increased anywhere from 2% to 20% compared to last year. 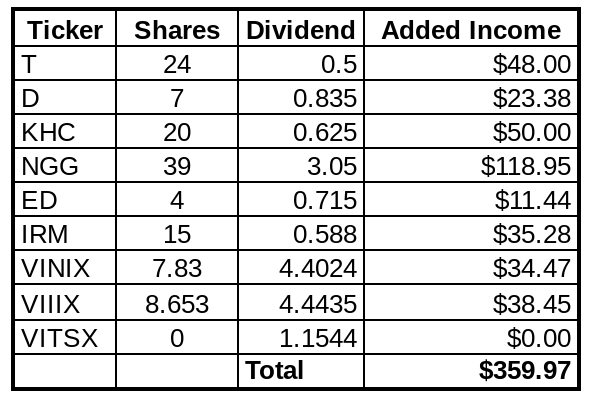 Man do I love the power of dividend investing! In addition to initiating new positions this year, I saw nice increases from Realty Income (purchased 3X in the first quarter) and Consolidated Edison. One of my goals this year was to build up smaller positions in my portfolio. I still have some work to do, especially with some of my recent purchases that aren’t considered “full” positions. But I have really enjoyed receiving at least $20 per month from Realty Income. Last, but not least, the mutual funds. At the beginning of the year, my wife and I decided to maximize our 401k and HSA contributions for the year. The results so far have been incredible. The table above shows that our top 3 dividend payments came from our retirement accounts and the income has grown by a decent clip. I love this automated investing strategy and it is nice to have a solid chunk of funds entering our accounts twice per month. Plus, the tax savings next year should be SWEET! I received three dividend increases during the month. The largest of which, by far, was McDonalds; which added $22 in annual dividend income to my forward income. I know the two of us, and so many of you, were PUMPED to receive that double-digit dividend increase. And the best part is that it looks like October will continue this 2018 trend. The next table will represent added income from stocks I purchased during the month in my regular portfolio and 401k purchases. It is crazy. With purchases and contributions, I was able to add $360 in forward dividend income this month! Armed with an arsenal of free trades from switching brokerages from Capital One Investing to Ally Investing, I was able to make a series of small purchases. Four of the purchases (T, D, KHC, and ED), were additions to positions I had already established in the past. Two positions (NGG and IRM) are new to my portfolio. And boy did those two new positions pack a punch for forward dividend income. This most likely won’t be my last purchase of IRM either as I would like to own at least 50 shares of this awesome REIT. One thing I did notice though is how quickly each of these small purchases add up! The last three additions were mutual funds, so those holdings are in our retirement accounts or HSA. If you noticed, I didn’t purchase any shares of VITSX during the month. This is the fund that is held in my HSA. The plan allows us to invest every contributed dollar once our cash balance is $1,000. If the balance is less than $1,000, you cannot invest another dollar until the balance returns to this mark. Unfortunately, I had to pay a few medical expense during the month and the bills exceeded my HSA contributions during the month. Thus, I could not invest any new capital into the investment account. I’m planning on resuming this again in October! All in all, with purchases and dividend increases, my dividend income increased over $385 this month! As I said earlier, the Indians are in the post-season and the Browns won a game for the first time since 2016. What could be better? All jokes aside, I was pretty happy and excited about the results this month. At the risk of sounding cliche, seeing results like these serve as excellent motivation to continue investing and making every dollar count. Now, let’s make this fourth quarter count and push ourselves even harder as 2018 comes to a close! This entry was posted in Monthly Summary and tagged Financial freedom, Investing, personal finance, Stocks. Bookmark the permalink. That is a lot of positive growth all around Bert. What I love is that you had such solid double-digit growth even while dealing with larger numbers. The dividend increases you experienced in September were also impressive (looking at MCD) – so, all in all, a very good report. Looking forward to seeing now October treats you. Thanks Dividend Portfolio! Much appreciated. October should be a fun month for us all and I’m looking forward to seeing the results start to trickle in. Loving the dividends Bert. A 58% YOY increase on an already impressive number is fantastic. I too just posted my September income and much like yourself am enjoying the benefits of compounding. Keep up the awesome job, you’ll be breaking that 2k mark in no time. Thanks Dr. Dividend! I can’t wait to swing by and check out your report. Expect a comment here shortly 🙂 Hopefully you’re right and $2,000 will arrive before I know it. Hey Bert, nice numbers, albeit I had to read the posts 3 times, could almost not tell what was your post and what was ads. I realize that you want to earn a bit of money, and I have not problems with that, but I think you might have gone overboard on this post. Any how, stunning numbers, well done and best of luck! Team CF – thanks for the comment and the feedback. Some of the ads are automatically inserted. I agree, that was way too much this time around. So I made some edits and hopefully it is a little better. Anytime you see something like that, do not be afraid to let us know. Wow Bert, you are crushing it right now and love that monthly total and fantastic YoY growth. Is it just me or is that table of stocks growing all the time? You’ve made some nice additions and they are paying off with the new dividends. I bought some IRM in September and just received the first payment the other day–and it was nice! The detail oriented side of me has to point out that your raises table is off for Realty Income, their raise was to $0.2205 and I suspect your spreadsheet rounded that. I wish they had done up to the $0.221 mark, and hopefully we never see them take it out an additional decimal place! Thank you so much! You’re right, I think the table does continue to grow and grow. AT some point I’ll have to stop adding new positions and just focus on building up my current positions. Sounds like an article for a different day hah Congrats on receiving that first IRM payment and I’m looking forward to my first one as well. You’re absolutely right, the spreadsheet rounded it and I didn’t catch it! Thanks for letting me know and I’ll make sure to edit it in the next revision. MDD – you’ll be there before you know it, that’s for darn sure. Just keep pushing and continue to hustle. It’ll arrive before you know it! Wow, Bert! 58% YOY growth in dividends on that capital base is impressive. It’s so inspiring and motivating to see the results that you guys are getting after several years of DGI. Keep it up! Love to read your incredible achievement! You’re in a four-digit dividend club! That’s great! 58% growth is awesome and it’s great to see that number above 1k in September. I love seeing those big numbers from the retirement accounts – great to get that tax free growth! Thank you very much! It has been a blessing seeing the retirement accounts grow. Maximizing our 401k contributions will be a regular staple for us going forward, that’s for sure. “The power of dividend investing,” indeed! Well done for the month of September. A serious year over year gain has go to put a big smile on your face. Those gains keep coming in at a nice clip. Like you, I also wanted to build up some of my smaller positions in my portfolio for greater dividend parity but it has been a challenge. Sometimes you get these great buying opportunities in positions that are already sizeable and well, you know the rest. Something to still consider though. Keep up the good work. 2019 is coming in sight. Thank you very much. Too kind of you. I haven’t been able to stop smiling in 2018. There have been so many great things that have happened for me, Lanny, and so many others in our dividend investing community. Heck, look at what you portfolio has done in 2018. It has been incredible. I agree about the dilemma about adding to large positions. I’ve kind of viewed it as “sure, the position may be large now. But over time, my allocation in the portfolio will be reduced as I make other purchases.” There isn’t a right or wrong answer, but that at least makes me feel better about having a larger position at the moment. Those 4 digits look great. Looks like you made every dollar count. Love that big jump on O that is monthly wow. A couple of big gainers and couple that were not there last year. $25.00 a month from dividend raises is awesome especially since you had some big ones at the beginiing that is just icing on the cake. Keep it up. Absolutely massive yr over yr growth at those kind of levels! The progress with the mutual funds in the retirement accounts and HSA really stand out, Bert… especially for VINIX, wow! You’ve certainly been busy on the purchase front… can’t wait to see the dividend boosts from those in just a few short months. You are setting yourself up for an outstanding 2019 here. You mentioned the Browns… do you like what you see with Baker Mayfield? Thank you so much! Too kind of you. I’m happy that ED is pushing up the charts and I’d love to continue adding to my position. I do like Baker, he is exciting, accurate, and you can tell he understands what ti takes to be a winning QB. Now, lets see if he can consistently do it and bring us a few more wins. It’s interesting you mentioned the ETF/Funds in your 401k as producing dividends. I just joined a new company and the options they provide aren’t focused on dividends. Sure, there’s an S&P500 fund that will generate about 1.8% in dividends, but nothing else. I’m going to focus on growing my 401k portfolio and worry about generating dividends when I eventually move those funds to my IRA. The options for my 401k aren’t dividend focused either. Like you, they are an S&P 500 fund. I use that regular investment to invest in the broader market and earn a good dividend. But then I’ll use excess capital to purchase individual stocks. So technically, I don’t own any individual stocks in my 401k either.